Staunch gun rights advocate Ted Cruz is here seen holding a shotgun while being interviewed by CNN. Can you see what he’s doing wrong? That’s right, he’s violating the first two rules of gun safety. Update: This says it all really. Properly observed, these rules are almost entirely capable of preventing accidental shootings. And I can’t emphasize how thoroughly they are drilled into shooters both as they’re learning and as they visit any gun range, gun store or participate in any organized hunt. 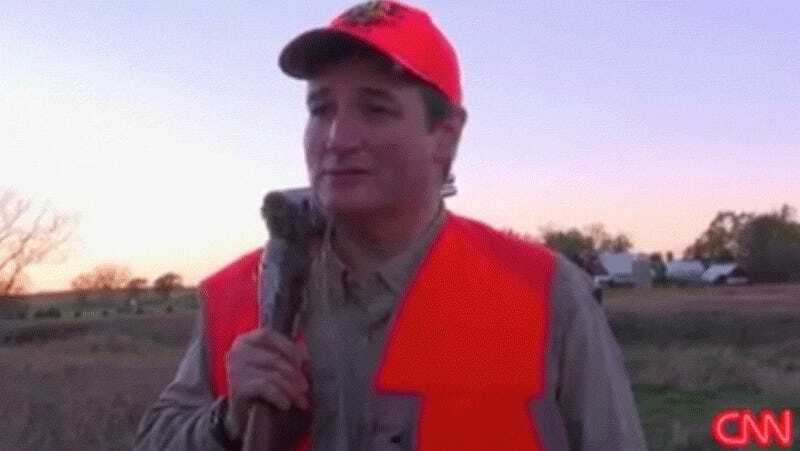 You can see buildings and people in the background — presumably other hunters — being swept by Cruz’s muzzle as he speaks. Carrying your break-action gun over-the-shoulder is an accepted form of carry. It’s a comfortable way to hold a heavy gun as you walk and can be done safely, if the action is open and the muzzle is pointed at the ground in front of your feet. Here, I’m doing just that as I hike up a hill in pursuit of turkeys. With the photographer behind me, my muzzle is pointed in a safe direction. Photo: Ben Godwin for Minimums. With an unknown number of people in front and presumably to his sides, the best way to carry his gun in this particular case would be to hold it sideways, low and pointed down. So what’s the point? As such an outspoken gun rights advocate, Cruz should also consider himself an ambassador for gun safety, particularly when choosing to make a national TV appearance while carrying one.